How to cook with Nutmeg, and have it taste good. You are here: Home / Produce, Products, & Ingredients / How to cook with Nutmeg, and have it taste good. Put down that jar of pre-ground nutmeg, PUT IT DOWN! Now walk away, WALK AWAY, do not touch it, never touch it again. Pre-ground nutmeg is disgusting, and here is why. Unless you’re a high volume kitchen you’ll never use pre-ground nutmeg fast enough, even assuming it was fresh when you bought it, so by the time you use it the volatile oils in the nutmeg, what give it the flavor, will have gone rancid, it will be bitter and taste horrible. The only nutmeg worth eating is whole nutmeg, if your store does not carry it you can buy it online such as at Amazon, they have 3.5oz which will last a good many months, even a year if you’re a rare user, they also have 28 oz which will last darn near forever…. and it will last. 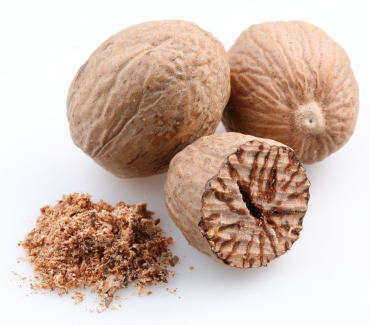 When nutmeg is left whole it does not go rancid because the volatile oils are protected inside the nut. I’m sure, eventually, it might lose flavor, but mine have lasted years without any such loss. So, you have whole nutmeg, what do you do with it? If you just need a tiny bit you can use a mircoplane grater and just grate what quantity you need directly into your dish. If you like more, or would like something more hand friendly, use a mortar and pestle. If you do not have a mortar and pestle, buy one. It is something no home should be without, you can use it to crush up herbs (garlic, rosemary, etc) to make rubs, or spices, or whatever. It is really easy to use too, and it will grind even hard things like nutmeg into powder. 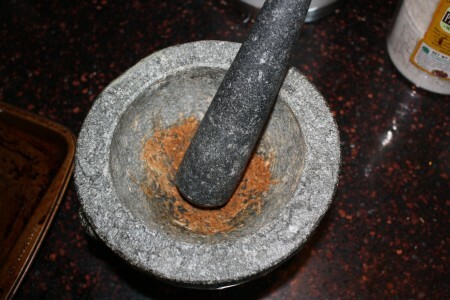 You just put your little nutmeg nut in the mortar and smash it with the pestle, this will break it into chunks, if you don’t need the whole nut, remove the chunks you do not need and put them back in storage, then pound pound pound, and grind grind grind, and you’ll get finely ground nutmeg powder in about 10 seconds. One morning my 3 year old woke before me, climbed on the counter, and started grinding nutmeg, it was so easy even he could do it. I guess he wanted pancakes. If you have trouble getting the nutmeg out of the mortar (when you grind it it can want to stick to the stone), use a metal spoon to scrape it out, no big deal. Then smell it and revel in the wonderful smell of truly fresh nutmeg, and add it to your dish.